Falcon Bird Xiaomi Tool is a small application for windows computer created by Power Mobile Team, which comes with multiple features for your Xiaomi Smartphones and Tablets. 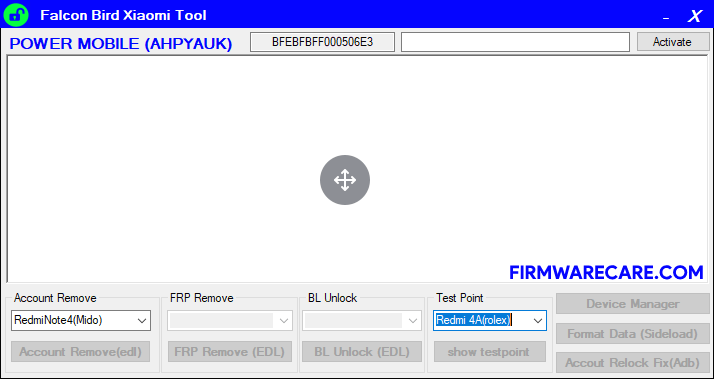 The main features of Falcon Bird Xiaomi Tool includes Mi Account Remove Edl Mode, Mi Frp Remove Edl Mode, BL Unlock Remove Edl Mode, Format Data Sideload and Account Relock Fix Adb. Falcon Bird Xiaomi Tool supports various Xiaomi models such as Mi Note 3, Mi 6, Mi 6x, Redmi S2, Mi Note 2, Redmi Note 5, Redmi 5, Redmi 5 Plus, Redmi Note 5 A Prime, Redmi Note 5A, Redmi Note 4, Mi 5x, Redmi 3s/3x, Mi5, Mi 5s, Mi 5s Plus, Mi Max, Redmi 4, Mi Max3, Redmi 4A, Redmi 4 Prime/Pro, Redmi 4x, Redmi Note 3 Pro, Redmi Note 3 Special, Redmi Note 4x, Mi Mix, Mi Max Pro, Mi Max, Mi 4i, Mi 4c and Mi 4s. In order to use the Falcon Bird Tool, you need to install the Universal ADB Driver on your computer. [*] Compatibility: The Falcon Bird Tool runs perfectly on Windows XP, Windows Vista, Windows 7, Windows 8, Windows 8.1 and Windows 10 (32 bit and 64 bit). [*] Credits: Falcon Bird Tool is created and distributed by Power Mobile Team (developer). So, full credits goes to Power Mobile Team (developer) for sharing the tool for free.